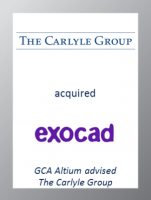 GCA Altium acted as exclusive financial adviser to The Carlyle Group on its investment in exocad, a provider of CAD/CAM software for the dental industry, in particular for dental laboratories and dentists. This marks GCA Altium's 18th transaction in the Technology sector in the last twelve months underscoring our leading position in Europe in this M&A area. exocad was spun out of the Fraunhofer-Institute for Computer Graphics Research IGD in 2010 and has since established itself as an independent developer of dental CAD/CAM software solutions. Its products are sold via a diversified network of partners and system integrators as part of OEMs’ CAD/CAM equipment across more than 120 countries worldwide. exocad is headquartered in Darmstadt, Germany, and has five offices globally. Equity for the transaction comes from Carlyle Europe Technology Partners III, a fund focused on European technology, media and telecommunications (TMT) companies. Fraunhofer Venture, which supported the growth of exocad since its establishment, will completely exit its stake in exocad while the founders continue to hold a significant shareholding in the company.